I've had issues with my andreani cartridges. They've always felt way undersprung. Today I opened up my fork tubes to replace the springs with Racetech 1kg and put new fork seals in. Couple things...the cartridge had unscrewed itself from the cap...that explains a lot. I was easily able to replace the fork seal without a seal driver. Made me think I was doing something wrong but I think it's fine. The racetech springs are much shorter than the stock but longer than the andreani. I'm not sure how to reconcile this. I (with great effort) got the RT springs on the AD cartridge (one of them, didn't have time for the other). I could cut the AD spacer but it's pretty product-specific and wouldn't be a simple job. I swapped in Racetech springs for a couple of thousand miles and because they were much shorter I used a piece of PVC tubing such as you would use in a sink drain (1.25" diameter maybe). Worked well and I liked the change but have since removed them and upgraded via Revs who replaced the rear shock too. Lost a bit of the stiffness I liked but everything is a compromise. Not sure if my solution would work in your setup but figured it was worth sharing. The issue is that the racetech springs are 2.5" LONGER than the andreani ones. I can't cut the spacer down enough to match that. When I installed them, I had zero sag and the forks were impossibly stiff. I gave up and reinstalled the andreani springs with heavier (7wt) oil. I maxed the preload and I'll make another effort to find my ideal reb/comp settings. Are the Racetech's progressive? If not then just cut the bugger's to the right length. No way. The ends are shaped and that shape is necessary. I've given up for now. I’ve never understood why aftermarket springs varied in length for forks, they don’t for shocks as far as I know. 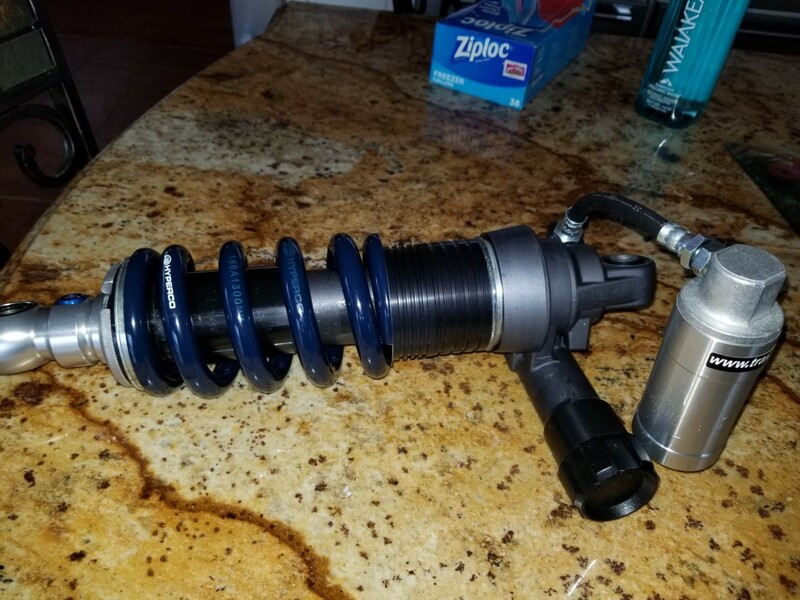 It really depends on the spring manufacturer ...the spring on my revalved rear shock is quite a bit shorter than the OEM spring. I am still trying to work out how the cartridge unscrewed itself from the cap - how do you think that happened?